ABC Mandrel Bending was started in 1998, as an extension to Gardbar, to mandrel bend alloy components used in manufacturing our brand of Bullbars.Our jobs can be between 1 to 1000 units; no job too small none too big. We generally only charge a minor setup fee if the job is required immediately. 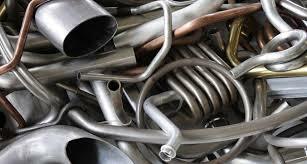 We are a supplier to the automotive and marine industries; our steel tube bending components are used in the manufacture of large trucks thru to Rollover Protection Hoops for Mine Vehicles, to exhaust systems for bikes and high performance cars. 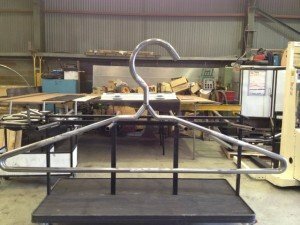 Our Aluminium and Steel rack hoops and Ute trade racks are supplied to most of the Aftermarket Ute Tray manufacturers in Victoria, as well as Alloy and Steel tubing for the bullbar industry. Our Polished 316 Stainless Steel tube bending is used from Houseboat railings, Leisure Boat Bow rails, Custom Swimming pool entry rails down to chair frames. Our railings appear from the South Pacific Islands to Hamilton Is. down to Phillip Is. We are a supplier to the balustrade industry with bent components in Stainless, Aluminium, Galvanised or Powder coated Steel. 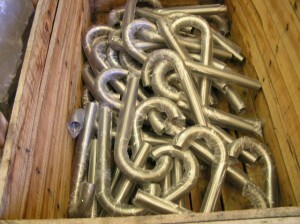 We can supply complete handrails, or components to fabricate on-site with the minimum amount of welding. We stock a range of 180 degree bends with tails in 2’ and 1.5” Stainless Steel tube as well as 40nb black or galvanised pipe. We also manufacture one of internal or external access rails for the elderly or infirm in a tube size that fits their hand, as these are generally required fairly urgently, we can normally complete within 5 working days. We can take your ideas from concept to reality; if you design it we will bend it or fabricate it for you. These are 3 meter wide Coat Hangers made out of 2” Mild Steel. We currently have 3 Computerised benders, a CSM 50mm CNC, a CSM 80mm CNC and a 200 mm capacity NC Hilgers. To complement our tight radius bending we also have a section roller to do curving and a Truform long radius bender for up to 50 NB pipe.